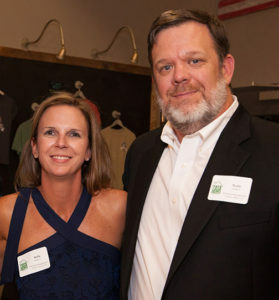 It is difficult to think of partners that have had a bigger impact on CASA’s efforts than Nella and Rusty DeMent. In 2014, they approached CASA staff with an idea for an outdoor party to gather friends of CASA and raise funds to help with the cost to operate our apartments. It was their hope to continue carrying the torch for Rusty’s mother, Lynn Robertson DeMent, who was a founding member of CASA’s Board in 1992. That first year, about 150 of us gathered under a large white tent at the DeMent family fishing cabin, and that’s how the name Cabin for CASA and the annual tradition began. The 2015 and 2016 events took place in Nella and Rusty’s front yard in Knightdale. Each year, more people came together to celebrate CASA’s housing mission. In 2017, we moved the event to a local brewery – and still we filled the room. Last week, we hosted a record crowd at the Fifth Annual Cabin for CASA and raised over $115,000. Every step of the way, Nella and Rusty have been gracious hosts, generous donors, and wonderful advocates for CASA’s housing. They’ve asked their friends and family to join the effort, and asked local businesses to donate auction items. DeMent Askew, Rusty’s law firm, has been a sponsor each year as well. Over five years, The Cabin for CASA events have raised more than $302,000 to support safe, quality housing for those who need it most. Nella and Rusty, your support and cheerleading encourages us all. Thank you!